Rachel and Anthony gave their first concerts in 2012 and it became instantly apparent to them that this musical partnership was something special – not only was this slightly left-of-centre musical combination very versatile and popular with audiences, but they played together like they had been doing so for years. They recorded this disc in January 2014, and simply chose pieces they enjoyed performing – this CD is a celebration of their friendship and musical collaboration so far. SORRY NO INTERNATIONAL SALES YET. “It truly is a delight to find yet another audaciously Australian release. The audacity is wonderfully apparent from the very start in the unorthodox ensemble which Scott and Schulz comprise – ‘cello and piano accordion in duet. 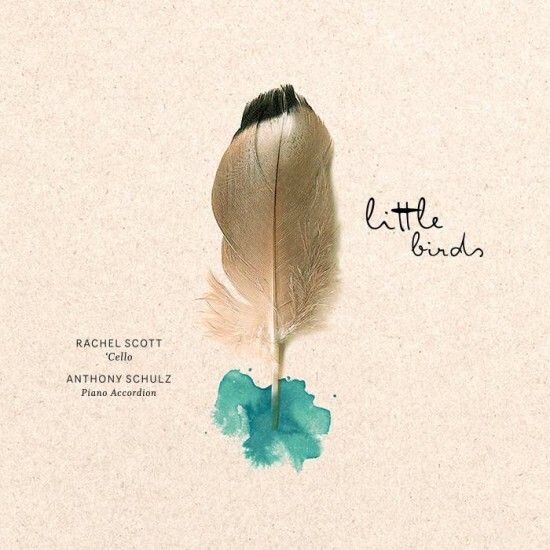 For such a pairing, the selection of works presented on “Little Birds” both reward the expectations of the listener and throws in a few well calculated surprises. Opening with De Falla’s Suite Populaire Espagnole, the duo establish the playful, Bohemian quality of the entire collection and their own musicianship in one swift stroke. Of particular note is Scotts employment of glissandi in her playing which always serves to enhance the performance, sometimes even comically so but nevertheless in line with the character of the piece and the ensemble sound. Indeed, there are numerous moments where Scott and Schulz blend their timbres so well that the effect is of one instrument playing. Appropriately enough, this occurs most frequently in their Bach inventions where one might dread the transposition from keyboard to accordion but, in this case, without cause.